Allocation Media Entertainment is a wholly-owned subsidiary of Web Global Holdings, Inc. a publicly-traded company on the OTC market (the ticker: WEBB), that creates and distributes both scripted and unscripted television programming. We create and own original programming and monetize its distribution via first-run syndication television to numerous broadcast, cable, digital, sports networks and foreign territories around the world. Our content is also geared for second screen friendly viewing distributed through social media, mobile devices and other video platforms. In addition Allocation Media Entertainment is developing the world’s first-ever streaming 24-hour Crypto TV News Channel named CryptoCake, devoted to emerging digital currencies and Blockchain technology news and information. CryptoCake will first stream on Amazon Fire, Apple TV, GoogleCast and Roku players. All of the content for this digital currency TV channel will be produced, distributed, and owned by Allocation Media Entertainment. Our Mandate: Create Significant Content! 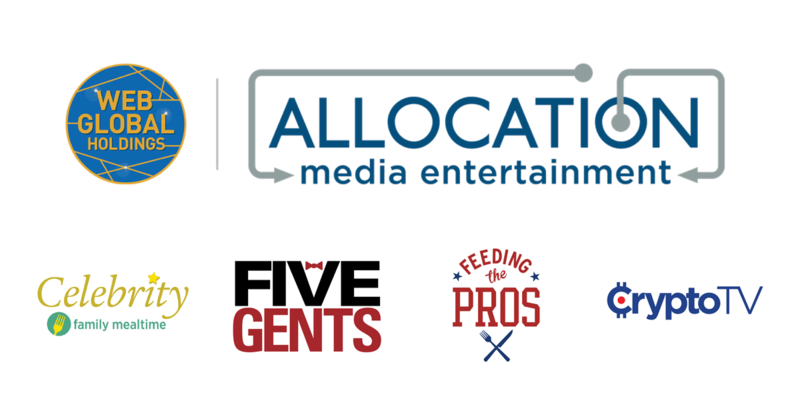 Allocation Media Entertainment has a topically diverse portfolio of original content for TV and Digital markets. Allocation Media Entertainment’s library of programs involve various interests to viewers. These programs include such subjects as cooking, sports, comedy, futuristic science as well as global finance with crypto-currency and Blockchain news and technology. We utilize the medium of television to reveal unique insights to its audience while making our content profitable, philosophically interesting, yet simple and entertaining for the whole family.